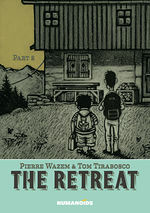 Two friends take off for a weekend getaway to a remote mountain area to reminisce about their third friend, now gone. From mundane conversations to intimate confidences, the two remaining pals remember their departed companion, their unique friendship, and all those things that are often left unsaid, but that remain floating in the silence. "Serving this simple, touching, straightforward story, Tirabosco’s art feels thick and creamy. . . . I’ve never seen anything that looks quite like this." This fine little stand-alone is quiet, dignified, and strangely relaxing. Mature young adults and older readers will no doubt be moved by this open-ended and somewhat philosophical offering. With The Retreat, you can project any number of feelings onto the panels in front of you and most of them would fit perfectly. It’s familiar, because loss is familiar. More importantly, This is great, graphic story telling for anyone. However you end up feeling about the ending, you walk away from it with a specific kind of feeling. It reads like over-hearing a conversation in coffee shop. Again, let’s call it poetry. 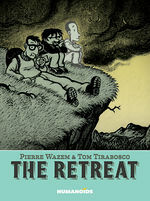 The Retreat is a reminder of how comics and graphic novels can capture incredible emotion, heartbreak, and meaningfulness in impactful ways. This work has a strong message and utilizes shifts in time to capture the memory and nostalgia involved in losing someone you care about.